India . Established: 2003 . Date of Birth: February 01. Place Of Birth : Bikaner, Rajasthan, India. 2Kms Before Chokhi Dhani Resort,Tonk Road, Jaipur-302033 Rasjasthan, India. 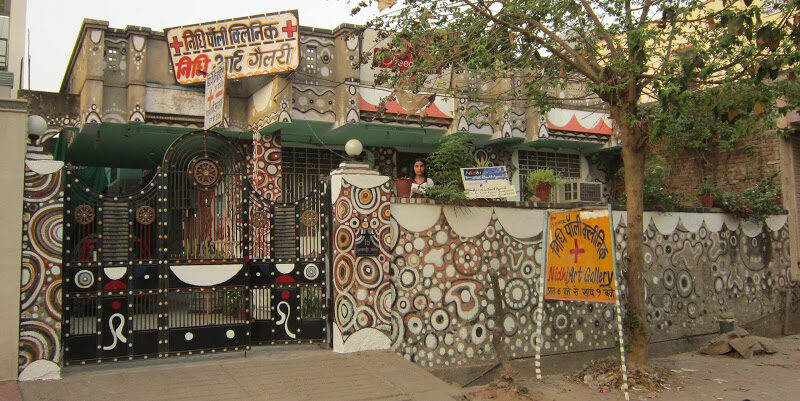 Education Qualification: Bachelor Of Fine Arts (Painting) from International College For Girls, Jaipur, affiliated to University of Rajasthan, Jaipur, Rajasthan, India. Master Of Fine Arts(Painting) from Faculty of Fine Arts,University Of Rajasthan,Jaipur. Exhibitions:One of the best art gallery Nidhi Art Gallery, located in Jaipur is exhibiting her work continuously since July 2003.Collections:....The Paintings of this great lady artist will give u in return:I. Decorative beauty of Ur house, office, business establishment.II. Give u pleasure of association with a great artist.III. If u know a little of art market u will realize that the painting of this great artist will give u return in future which no other investment can match.IV. Forget investing in Land, Gold, Shares, Mutual Funds, Fixed Deposit and all other avenues of investments as they can never stand in front of this great artist paintings return on ur investment.More About The Artist: NIDHI BANDIL AGARWAL contemporary work is often described as contemplative. Her stylized portraits of women share similar features yet each remains distinct. The female figures grasp at the viewer but remain enigmatic. Through facial expression and posture, she tries to show, rather than resolve, the mysteries behind the women she paints. One figure will look confrontational while another will appear coy. The truth behind these expressions is never fully revealed. Contour lines flatten and compartmentalize shapes while simultaneously emphasizing the intrinsically balanced aspects of the design. Repeating lines and shapes create natural, rhythmic elements in her works. Fine textural lines that convey a warm, earthy tone, emphasizing women’s ½s feminine qualities, mute colors. Overall, Nidhi captures women’s ½s dichotomous nature: strong and confident, with a definitive presence but also delicate, beautiful and soft. Never presuming to explain womenï¿½s nature, the artist revels in their mystery. Nidhi uses the language of art to emphasize both her own psychological nature and the women she paints. There is a true exchange between this painter and her subject matter: she explores and confronts herself through the eyes of her female figures. The Great Artist Nidhi Bandil Agarwal is not merely beholding her women but they are beholding her as well. Nidhi has been involved with nature for the sake of her visual language through with she wishes to comminicate. 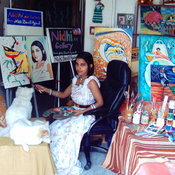 she has developed a rare dexterity in painting birds, animals and portraints.Nidhi, free from shakles of ane art style or technique, has her own clear vision and distinct style to render meaningful touch to her paintings".